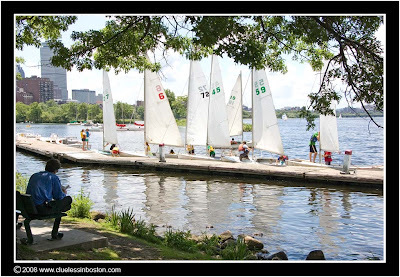 A leisurely summer afternoon on the banks of the Charles River. This is a beautiful shot! Perfect for a Sunday morning! Very nice . . . I agree with Kelly. The boats and the reflections in the water have such a painterly quality to them. I like the way you used the foliage to mask an otherwise dull sky. The reader in the foreground adds another layer to this classic picture on 'The Charles'. There's lots going on in this shot, and the reader to the left is a good anchor (ahem, for the photo, not the boats). Is this a sailboating class here?